A's comet probe Rosetta has for the first time ever measured nitrogen gas at a comet, providing clues to the early stages of the formation of our solar system. Molecular nitrogen, N2, is the major molecule in the atmosphere of Earth and is also present in the atmospheres and the surfaces of Pluto and Neptune's moon Triton. It also is thought to have been the dominant form of nitrogen in the early nebula from which our solar system emerged. Martin Rubin from the Physics Institute at the University of Bern and his team were now able to measure this "most wanted molecule," as Rubin calls it, in the coma, the atmosphere, of comet 67P/Churyumov-Gerasimenko. Matt Taylor, ESA's Rosetta project scientist, calls the discovery of molecular nitrogen "another piece of the puzzle" in terms of the role Jupiter-family comets played in the evolution of the Solar System. "But the puzzle is by no means finished yet," he adds. "Rosetta and Chury are about five months away from perihelion now, and we'll be watching how the composition of the gases changes over this period, and trying to decipher what that tells us about the past life of this comet." It is for the first time ever that scientists were able to detect nitrogen molecules at a comet. "Although some comets like 'Chury' were probably formed in the same region as Triton and Pluto, until now we weren't able to find any molecular nitrogen in them," Rubin explains. "Because a comet's water ice can trap only small amounts of it remote sensing as well as in situ analysis were simply not sensitive and precise enough." Rubin's team conducted the measurements with the mass spectrometer ROSINA which was built at the University of Bern. The instrument is located on board of Rosetta, the European Space Agency's comet probe. The craft arrived at Chury in August 2014 after a ten year journey through space and has been collecting data on the comet ever since. "ROSINA has the required resolution to distinguish on site molecules with almost identical molecular weights, which is the case for carbon monoxide and molecular nitrogen," Rubin says. He adds: "It is great to see that an instrument, designed and built almost 20 years ago, finally delivers the data so long sought-after. This is one of the key measurements of ROSINA." The results of those measurements were now published in the journal Science. The nitrogen measurements suggest that Chury formed in a very cold region of our solar system. 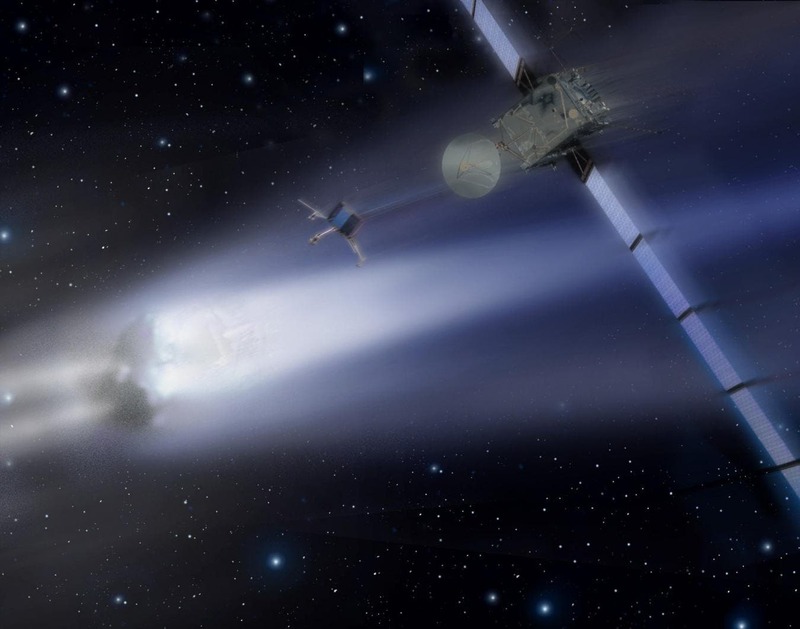 "The amount of molecular nitrogen brought to Earth by comets such 67P/Churyumov-Gerasimenko is small compared to other nitrogen-bearing molecules like ammonia," says ROSINA Principal Investigator Kathrin Altwegg. According to her, these results add to the growing evidence that Jupiter-family comets like Chury cannot be the major source of both water and volatiles like nitrogen on Earth. Altwegg and her team had recently discovered that the ratio of deuterium to hydrogen in the water of the comet differed from that on Earth, which indicated that the latter had a different source. "Like the origin of our water, the missing molecular nitrogen in comets was another open question raised during the Giotto mission to comet 1P/Halley almost 30 years ago," she explains. "It is very satisfying that it can be finally answered now."